Welcome to the Swing Into Spring Giveaway! Spring is finally here (hopefully it won’t decide to snow again like it did Monday, though!) and my kids are chomping at the bit to play outside. A swingset is a fabulous toy that grows with the kids… I hope to have mine around even for the grandkids some day! 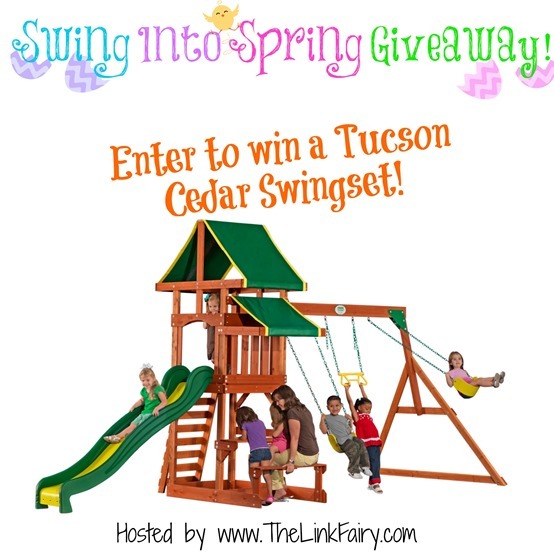 Here’s your chance to blow away all those Winter woes by entering to win a Tucson Cedar Swingset! Enter through the widget below. Giveaway ends on May 9th. Open to US and Canadian residents 18+. This giveaway is in no way associated with facebook, twitter, pinterest or other social media. OurKidsMom is not responsible for the fulfillment or shipment of prizes. If you’d like to have your product hosted through a Link Fairy giveaway, please contact Rachel at topfairy@thelinkfairy.com. I like the covered play deck & slide. My kids would love the slide the most. I love that my nephew will have hrs of enjoyment with this. I love the two swings included in the set! I love the covered play deck. I love the picnic/activity table. Awesome! I love the trapeze bar. The slide is the best part! I love the Trapeze bar. How fun! My favorite part is the swings. They are perfect for my kids as opposed to the smaller baby ones. My favorite part is the slide because that’s my niece’s favorite thing when she goes to the park. It’s fun to see how excited she gets about going down a slide. I like the picnic table. The kids would have fun taking their snacks outside. The slide is my favorite! I like the Play Deck- and all the safety that it has covered! i like the picnic table that would be my daughter’s favorite part! My favorite part is the slide. My favorite part is the slide – fun! I like the Covered play deck! I like eco friendly cedar. The SLIDE is my favorite part! I love that the playdeck area is covered! I like that it is made of cedar and that it has a picnic/activity table and a rock wall. Actually, I like all the features. My favorite part is the bench where i could set with them my kids have never had a play set/swing set and would love this. The Rock wall would be a favorite of my grandchildren. Love the slide the most. I love that it comes with a covered play deck! The slide!! It’s so big compared to the ones I’ve seen online for sets! I love the picnic/activity table. That is so unique for a playground and perfect for summer popsicles outdoors! I love the slide the most! Who doesn’t like a speedy slide to play on? I love the built in picnic table. My favorite part is the rock wall. My daughter will love the slide! They are so fun! I like the covered play deck. I love the rings and the slide! My favorite part of the swing set is the slide. I like that it’s made of wood. The swing is my favorite part. I love the bench and table on the side, perfect for lunch or a snack! I wouls say the slide is my favorite part. I love the covered play deck! This swing set looks awesome! my favorite part is the slide.. I like that it has the soft swings! My favorite part of this swing set is the Covered play deck. J’ aime bien la table à pique- nique, si un jeune veut dessiner ou si la maman veut s’ asseoir pour se reposer, c’ est pratique et en plus à l’ ombre, bien pensé. I really like the 8′ Super Safe Speedy Slide – should last the granddaughter a long time! I love that this swingset has a Picnic/activity table area. That is so cool. I have never seen another set with one. Perfect for picnic lunches or just hanging out. The slide, my kids love slides. I like the fact it’s made of redwood. I like the Trapeze bar. The canopies that provide shade. My kids would like the slide. I like that it has all the extra stuff like the slide, covered deck and bars attached to the swing set. It makes for a great play area for the children. My favorite part of this set is the swing and the slide. The seating on the side is also pretty cool. My kids would have SO much fun with this! my favorite part of the swing set would have to be the slide because the kids love to go down it. I like that it has a picnic/activity table… that’s different. I love the little picnic bench and table under it. So cute! First, I love it is made of cedar and has the canopy top. Also, the design is outstanding. Each play area is separate. It is great for the kids, and I think it enhances the landscape of the yard. For me the activity table I can sit work and take care of the kids but for the kids i would have to say the play deck. I love the picnic/activity table that goes with it and the covered play deck. My kids would love the Trapeze Bar! I like the 8 ft slide! I like that it is made from wood. I like the 8′ slide! Pretty awesome.